The metal clock movement gears were dry and seized. Fine synthetic Swiss watch oil was applied so that clock movement was freed and worked by manual winding. The electronics were checked and failed rectifier diode was removed. Correct electrical connections were restored allowing solenoid to fire when points made contact to begin cycle. The four winding mechanism springs were making the solenoid cycle and wind springs every twenty seconds. New springs allow the clock to run for over minute between solenoid winding cycles. The solenoid was replaced because original was failing due to corrosion. A new thermo-fuse was installed in place of an external fuse that was not original or correct for the clock. If the mechanical clock seizes someday with the solenoid points engaged, the open circuit will melt the thermo fuse and close the circuit instead of allowing heat to melt clock or start fire within feet of fuel source. The combination of a leaking carburetor or fuel line and a clock that is not fused correctly can burn the car down, if the car is parked in garage under house, then you could burn the house down. The dust cover had holes and electronic components added. The non-original, non-OEM parts were removed and holes sealed. Balance spring adjustment port access was covered with clear tape to seal out fine dust and grit. The dust cover had two cracked feet that were repaired. A new gasket was used to glue base of brittle plastic dust cover for structural support. Another new dust cover gasket was added to replace the original dust cover that was aged. The light bulb works now. The diagnosis as to why bulb was not working too some time. The light bulb port was rusty and corrosion caused electric contact to fail. Port was sanded to remove rust and treated with corrosion cleaner and inhibitor. The bulb holder (copper/brass?) had turned green with corrosion. Now it is polished and capable of making electrical connection. The working clock was observed for several days with adjustments made daily and measurements by VibroGraf until calibrated. The clock was observed to be accurate for 48 hours before being unplugged from electric for cosmetic work. The acrylic clock window was polished to remove fine scratches. Removing the bezel allowed better access to the acrylic edges to remove more scratches than otherwise possible. The clock hands were sanded smooth and painted to match the color of dial indexes and numbers. We approach clock repair a bit differently than mechanic shops. To us, clock repair is as much of an art form as it is a trade. 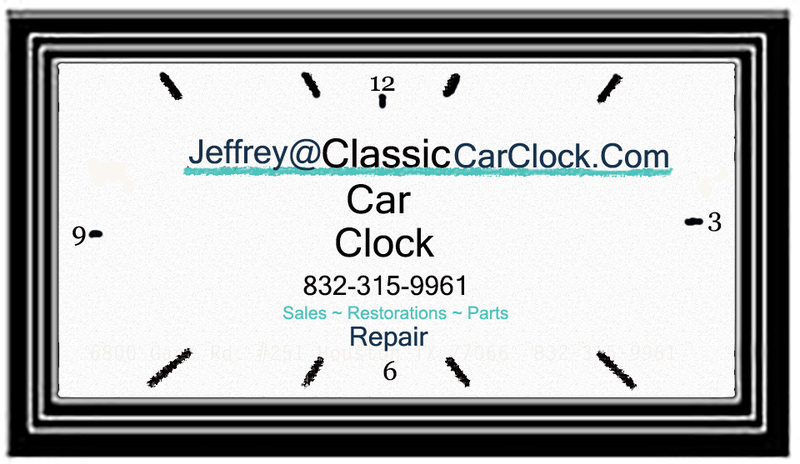 Everyone at Classic Car Clock is passionate about our job as we really love cars and clocks! Every clock that comes to our shop is thoroughly inspected and photographed before being diagnosed for repair and restoration. We consult with its owner to provide options after mechanical service; showroom condition or natural patina?